We had the whole day to ourselves, so we decided to do a nice motorcycle ride. He’d never been to Lick Observatory on Mt Hamilton, so I said, “go there, we must” in my best Yoda voice and off we went. Freeways out to Livermore were boring as always, but we remembered the Hwy 84 shortcut from Hwy 880 directly into Livermore (bypassing Hwy 580), so that shaved a bunch of time and stress off of the ride. Peter led through this part because I still haven’t solved the Z mirror issue…leading on the freeway is nearly impossible for me as I can’t see a damn thing behind me over 75mph. In Livermore, we peeled off to Livermore Avenue on our way to Mines Road. We made a quick stop at Concannon Vineyard for a bottle of wine, and managed to amaze the sommelier with our utter ignorance of wine. We couldn’t have been the first people stopping by for “whatever tastes good”, but you wouldn’t have known it from this guy. I guess most people do a wine tasting round before purchasing, which of course we weren’t going to do when faced with 80 miles of twisties. I was really pleased to hear that Peter liked Mines Road, too, because it’s one of my favorites. I really appreciated the light traffic yesterday, too, as the one downside of Mines is that some corners make me confident that my last sight on earth will be of an oncoming Gixxer headlight running wide. As you can probably tell in the clouds in that last photo, it did rain on us for a couple of minutes. This is because, bar none, every single ride I ever take with Peter has rain. So we had our requisite droplets, which resulted in some amazing cloud patterns for the rest of the ride up to the Observatory. A couple of cool photos of the bikes; I love how the red and blue play off each other. Carl rode off down the mountainside again, and Peter and I headed into the Observatory for their 15-minute tour. 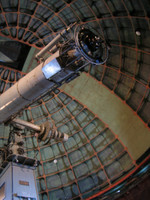 We saw the 36″ refractor telescope (the largest functioning refractor in the world now, since the 40″ lens at Yerkes cracked) and heard the history of James Lick. It’s still my favorite story EVARRR that Lick’s body was exhumed from San Francisco and reburied underneath the refractor telescope upon the Observatory’s completion. Our guide joked that that should have become a fad for millionaires, to build huge telescopes so that they can be buried beneath them. I agree, because huge telescopes are really frickin’ cool. We puttered around the Observatory a bit, but it was closing time, so we had to get going. 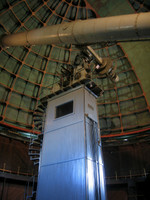 I still haven’t seen the 3-meter Shane reflector telescope; we’ll have to get there early enough next time. Quimby Road down into San Jose was its usual fun, only this time instead of just the 10mph hairpins on the 11.5% downhill grade, there was gravel in the turns and deer in the road. Ah, Quimby. We made it home with plenty of time to warm the hot tub and open the bottle of Petit Sirah, which made our lips and tongues goth-lipstick purple. Whee! A good time was had by all. 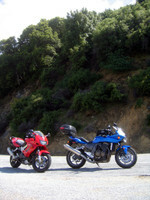 This entry was posted in Rides, Superhawk, Z750S. Bookmark the permalink. Such a fun road! Glad Peter enjoyed it. What is that big “7” spraypainted in the middle of the right-hander in that picture of Peter? The whole road had those mileage markers — I don’t know what they’re for. They go up to 22 or so along Mines Road and then go back down to 0. I have lived here my whole life, always wanted to go there, but like a lame-o never have. Sounds like such fun. Glad you guys had such a great time. 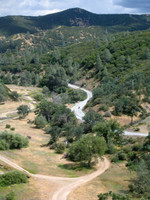 Calaveras rd from San Jose to Sunol makes a good entre’ to Mines… more gravel-strewn 1.5 lane twisties. From Sunol take Foothill to Pleasanton, and Vinyard from there to Livergulch. Hee! Sorry, Sylvie. 😉 Bom chicka chicka bom chicka chicka! The Yerkes 40-inch is 100% functional. The crack was stopped about a half a inch in–then they hired a man with the most stressful job ever: he drilled a hole in the glass to stop the crack. Heh, cool, thanks for the clarification. I was assuming that the crack caused a significant reduction in aperture (I’ve been to Yerkes, but many many years ago).